Nifty Sensex closed at a positive value. Nifty closed at 7964.80 up to 5.90 point and Sensex Closed at 26630.51 up to 33.40 point. Befoe some hours nifty crossed a 8000 but moved down to 7960. About 1370 shares advanced, 1532 shares declined, and 101 shares were unchanged. Today top gainers is HDFC, ITC, Sun Pharma, Reliance and Cipla. Today top losers is DLF, Hindalco, Tata Steel, ICICI, Axis Bank and BHEL. We provide free trial, intraday and delivery based calls in equity and commodity market with 96% high accuracy. In mid session of market nifty reach after 1 week 8030 point but nifty move down to 7960 after some hours nifty sensex gain slowly nifty is up to 8.45 point at 7967.35 and sensex is up to 62.54 at 26659.65. Shares of TCS, ICICI Bank and Axis Bank declined 1-2 percent. ITC, Reliance Industries, Infosys, HUL, Tata Motors, SBI, Coal India, Bharti Airtel, Wipro and BHEL lost 0.2-0.8 percent. 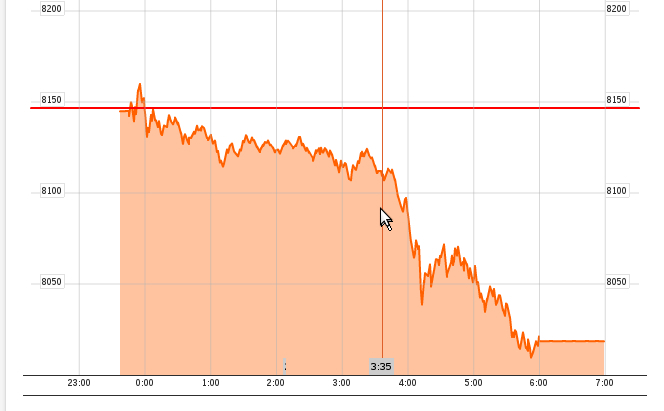 Dollar gain to 0.19 point at 61.72, 0.31 percentage. We are providing nifty updated news, free trial, profitable calls with high accuracy. Investor invest a money 1 to 5 lac in month. So hurry up and find a profit with us. Indian Benchmark gain in mid noon, in morning session nifty and sensex move down side now cover up point value in positive mode. Nifty gain 61.45 point at 8020.35 and Sensex gain 217.18 point at 26814.29. After the Reserve Bank of India kept policy rates unchanged. Auto, healthcare, capital goods and HDFC twins supported the market while technology and FMCG stocks remained under pressure. Auto stocks like Maruti Suzuki, Bajaj Auto and Hero Motocorp gained 1-1.8 percent followed by Tata Motors with 0.4 percent upside while HDFC and HDFC Bank were up 2.6 percent and 0.4 percent, respectively. Nifty sensex move like as 10 point move down or 10 move to up. Market is slack and RBI no changes in any rate of market. Nifty move 7963.15 gain to 4.25 point and Sensex 26614.41 gain to 17.30 point. The central bank has kept key rates unchanged. About 1322 shares have advanced, 933 shares declined, and 69 shares are unchanged. Rajan has said that he'll keep interest rates unchanged until there are convincing signs of inflation falling to 6% by January 2016. Those seeking signs of a possible easing of policy will look for the socalled 'fan chart' forecasting inflation, which may be pointing lower than in August due to sliding commodity prices and improving government finances. We provide free trial in all segment and provides profitable intraday and delivery based calls in equity and commodity market with high accuracy. Nifty Sensex open flat, nifty opening on week point and wait for a RBI monetary policy. Many market experts and economist believe that RBI wll leave the rate unchanged. Nifty trading 39-points down following weak global cues, the Nifty is expected to week opening. Yesterday, major indices ended with marginal losses but midcaps continued to rally. Traders too were cautious ahead of the Reserve Bank of India credit policy review. We provides tips like as nifty tips, bank nifty tips, nifty futures tips, free nifty tips, intraday tips, stock & share market tips. Nifty Sensex opening week and wait for RBI policy, Nifty opened at 7948.80 down to 10.10 point and Sensex opened at 26590.20 down to 6.91 point. About 364 shares have advanced, 198 shares declined, and 24 shares are unchanged. Top gainers is Tata Motors, Wipro, M&m, Dr. Reddy's Labs, Tata Power. Top losers is Hindalco, Hero Motocorp, SBI, BHEL and Reliance. The Indian rupee opened marginally lower at 61.60 per dollar as against previous day's closing of 61.53 a dollar. We are providing free trial and profitable, intraday and delivery based system calls in equity and commodity market with high accuracy. Finally nifty closed at nearly 7950 and sensex closed at nearly 26600. Nifty closed down to 9.95 point at 7958.90 and sensex closed down to 29.21 point at 26597.11 Sun Pharma is the top gainer on the Nifty. Its merger with Ranbaxy is expected to be on FIPB agenda on October 1. About 1857 shares have advanced, 1088 shares declined and 100 shares were unchanged. Top gainers is Sun Pharma, TCS, GAIL, Hindalco, Wipro and Infosys. Nifty Sensex market moving on down nifty move down to 20 point and sensex move down to 57 point. In morning times nifty sensex flat but opening on positive value after both are slack same running positive value but before close market nifty sensex move down, all traders alert is the situation of stock market. Nifty cover up his point value some point like as 10 to 20 point. Top gainers is Sun Pharma, TCS, GAIL, BHEL and Cipla . Top losers is Tata Steel, Bajaj Auto, Coal India, ITC and Jindal Steel. We are providing tips like nifty tips, bank nifty tips, bank nifty futures tips, nifty futures tips, stock & share market tips. Today nifty flat twice time, nifty is up to 18.50 point at 7987 and sensex up to 72.40 point at 26698.72. Before closing market nifty only move 18 point. After opening some hours nifty, traders was thinking nifty gain with high point but today nifty slack. Top gainers is Sun Pharma, TCS, Infosys, BHEL and GAIL. Top losers is Tata Steel, Bajaj Auto, Hindalco, ITC and HUL. Shares of IDBI Bank was up 3 percent intraday after its board meeting. In the meeting held on September 26, the board has approved to increase borrowing limit to Rs 15000 crore from Rs 4000 crore. Today no movement nifty and sensex, in opening time nifty sensex flat after consolidation mode and then now slack. Movement like either move down 10 point or 10 point move to up. Researcher said diwali time nifty will move on positive value. Nifty at 7982.70 gain to 13.85 point and sensex at 26682.00 gain to 55368 point. About 1728 shares have advanced, 828 shares declined and 79 shares are unchanged. Midcaps, IT and pharma stocks are supporting the indices with smart gains. All eyes are now on the Reserve Bank of India as the market gears up for the policy announcement tomorrow. A CNBC-TV18 poll suggests that Raghuram Rajan may hold fire this time. Bankers, dealers and company CFOs expect no rate cut in the policy tomorrow but a tone as hawkish as august. Top gainers is Sun Pharma, TCS, Cipla, BHEL and Infosys. Top losers is Hindalco, Tata Power, Coal India, Bharti Airtel and ITC. Nifty struggles below 8000. In the opening time nifty sensex flat and move to up 15 point but now no movement like as 5 point move to up or 5 point move to down. Nifty 7972.30 up to 3.45 point and sensex 26656.95 up to 30.66 point movement. Top gainers Sun Pharma and TCS reach to 3%, Wipro, Infosys, BHEL. Top losers is Hindalco, Tata Power, Bharti Airtel, Coal India. The dollar move to up 0.030 at 61.89 gain with 0.50 percents. We provide nifty tips, bank nifty tips, nifty futures tips, bank nifty futures tips, stock & share market tips with high accuracy. Nifty Sensex flat, nifty open at 7984.80 gain up to 15.95 and sensex open at 26690.59 up to 64.27. Before 1 day nifty closed at 7968.85 and sensex closed at 26626.32. About 474 shares have advanced, 127 shares declined, and 22 shares are unchanged. Top gainers is Tata Steel, Wipro, Infosys, Reliance, Axis Bank. Top losers is Tata Motors, Bharti Airtel, ITC, Coal India. We are providing live updated news nifty and sensex market and provides free trial to our clients. In this week nifty market performance very slow movement nifty move down and up its end of the month gain with 57 point. In 22 September nifty open at 8084.45 and 26 September closed on 7968.85. In expiry time breaks 7950 point and move on 7000 but suddenly after some hours nifty gain and move on 8000. This week many times nifty opened at flat, after under pressure slack also. Nifty futures closed at 8031 with a high of 8057. The 50-share NSE Nifty lost 152.6 points or 1.9 percent to 7968.85 while the broader markets hit badly. The CNX Midcap and BSE Smallcap indices were down 3.7 percent and 6 percent, respectively. Nifty for next trading session would have the resistance of 8080 if it breaks this level than having the next resistance of 8150 and in down side having the support of 7930 if it breaks this level than having the next support of 7880. Top nifty gainers is Sun pharma, Jaiprakash, financial Technologies, City Union Bank. Sun Pharma - Yesterday Sun Pharma open at 768.40 and closed at 806.60 gain 32.35 Sun Pharma gets Form 483 for Halol plant but the chances of an import alert are low now. Jaiprakash Power - Yesterday Jaiprakash Power Closed at 12.80 gain to 1.10 point, JSW Energy will buy JP Power's 3 power plants of 1,891 MW capacity. Financial Technologies - Yesterday Financial Technologies closed at 217.95 gain to 15.10 point, MCX says board approves new tech agreement with Financial Technologies. City Union Bank - Yesterday City Union Bank closed at 82.95 gain to 4.65 point, RBI says FII investment in City Union Bank hiked to 40 percent from 35 percent. Shares of JP Power Ventures rose 13 percent intraday on Friday after it has inked a binding memorandum of understanding (MoU) with JSW Energy for selling three plants of 1,891 MW capacity. These include 300 MW Baspa-II and 1091 MW Karcham Wangtoo hydro electric plant and 500 MW Bina thermal power plant. It seems to be third time lucky for the JP Group, as a day after Reliance Power pulled the plug, JSW Energy stepped in as the Saviour. "The deal is premature to disclose the value of the deal as numbers are derivative," Jindal said. Meanwhile, JSW Energy will raise debt to complete this transaction, he added. Finally nifty sensex move on positive value in closing time nifty move to up 57 point at 7968.85 and sensex move to up 157.96 point at 26626.32. 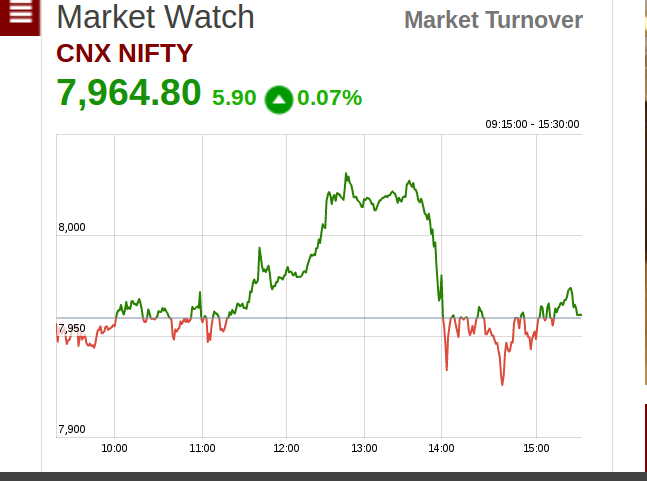 Mid noon nifty sensex both are flat and its slack after 2 pm market move on positive value. Global rating agency Standard & Poor's (S&P) has upgraded India's credit outlook to stable from negative. Dollar held near a four-year high against a basket of currencies on Friday, fuelled by the biggest yield advantage over the euro in nearly 15 years as the Federal Reserve contemplates hiking interest rates. About 1585 shares advanced, 1376 shares declined, and 89 shares were unchanged. Top gainers is Hindalco, DLF, Jindal Steel, Sunpharma, NMDC. Top losers is HDFC, GAIL, ITC, TCS, Tech Mahindra. Nifty moving on 7800. Nifty move down to 53 point at 7858.85 and sensex move down to 178.22 point at 26290.14. Before some hours both market gain but now nifty sensex flat. Auto components maker Rico Auto has announced the sale of its 50 percent stake in FCC Rico to its Japanese partner, FCC Company, for Rs 495 crore on Thursday. The 50:50 joint venture was for manufacturing and supplying automobile clutch assemblies. Shares of HDFC, Maruti Suzuki, ICICI Bank, Hero Motocorp, Cipla, Sesa Sterlite and Punjab National Bank were prominent losers, falling 2-3 percent. TCS, ITC, SBI, Tata Motors, , Dr Reddy's Labs, and Bajaj Auto declined 0.9-1.7 percent. Today nifty open with low point after half an hours nifty sensex gain and move to up 50 point but now market flat, nifty move down to 15.90 at 7895.95 and sensex move down 70.79 point at 26397.57. The market is absolutely flat as weak global cues, the recent streak of FII selling and impact of the Supreme Court verdict on coal blocks remains an overhang. About 1148 shares have advanced, 1182 shares declined, and 77 shares are unchanged. Top gainers is ONGC, Tata Steel, Hindalco and M&M. Top losers is Coal India, Sesa Sterlite, HDFC, TCS and Hero MotoCorp. Researcher wait for a Narendra Modi speech in America his speech may be changed the market movement in which our economies can be control . In expiry time big loss by the market is the history of 7th series. Traders believes on market and waiting a big news so that he invest a big money in the nifty sensex and other segment. Finally nifty and sensex gain after 3 days, in expiry days nifty move down to 90 point and sensex move down to 300 point. today nifty sensesx opening also down but after half an hour nifty sensex both are gain.Researcher said in October month nifty will gain but in diwali times nifty will not a give any movement. So all traders alert in nifty and sensex. Currently nifty gain 17.85 move to up and sensex 26497.38 gain 29.02 move to up. 990 shares have advanced, 912 shares declined, and 53 shares are unchanged. Currently top gainers is Hindalco, ONGC, Tata Steel , DLF NMDC. Currently top losers is Cipla, Coal India, HDFC, ITC, Jindal Steel. We provides free trial in all segment and provides profitable intraday and delivery based calls in equity and commodity market with high accuracy. Today nifty sensex opening in lower side nifty open at 7885.85 and sensex open at 26429.30 where as yesterday nifty closed at 7911.85 and sensex closed at 26468.36. Nifty move down 17 point at 7894.95 same sensex move down 73.61 point at 26394.75. About 308 shares have advanced, 506 shares declined, and 24 shares are unchanged. Sesa Sterlite, Coal India, Axis Bank, Tata Motors, Hero Motocorp, Jindal Steel, and PNB dropped 1 to 3 percent while Wipro, Cipla, ONGC, Infosys, Bajaj Auto, Lupin, Tech Mahindra, DLF and IndusInd Bank gained 0.3 to 1 percent. Finally nifty ends at 8000 on Expiry, F&O Series also closed lower in last series. Niffty closed today move down 90.55 at 7911.85 and sensex closed move down 276.33 at 26468.36. Index fell in last seven series 31 percent and in September month index fell on 0.5 percent. Total market turnover was Rs 8.5 lakh crore, the highest ever while NSE F&O segment clocked turnover of Rs 5.3 lakh crore today. The broader markets too saw huge selling pressure with the BSE Midcap and Smallcap indices falling 2-3 percent. For the series, these indices outperformed benchmarks, up 0.6 percent and 1.8 percent, respectively while in last seven series, both gained 50 percent and 66 percent, respectively. The government’s decision to defer gas price hike is a bigger negative than coal block de-allocation ruling, said Arvind Sanger of Geosphere Capital. Traders believe in nifty in october month provide a good profit . Top gainers is Dr. Reddy's, Cipla, TCS, Zee Entertainment, GAIL, Infosys. Top losers is SBI, Axis Bank, Hindalco, BHEL, Reliance, ONGC. We provides free trial, intraday and delivery based calls in equity and commodity market with 96% high accuracy. Today nifty and sensex both are move down where nifty breaks 7900 in one month and sensex move down 300 point. Nifty move down 122 point at 7880.40 and sensex move down 300 point at 26355.27. 593 shares have advanced, 2312 shares declined, and 80 shares are unchanged. Today market turnover is 7 lac crore at first time. We provides nifty tips, bank nifty tips, nifty futures tips, bank nifty futures tips and provides free trial. Today nifty and sensex sluggish. After Mid September nifty move down side. 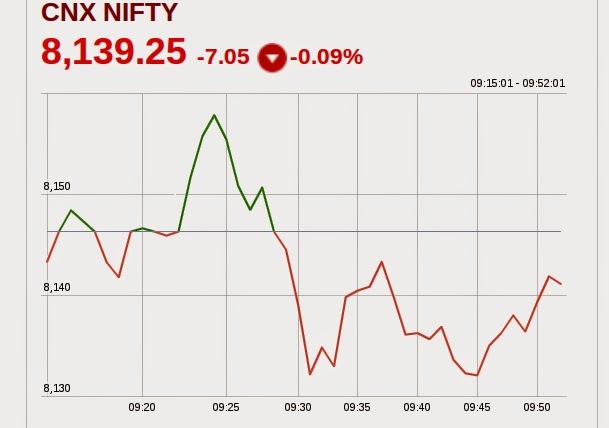 The Nifty is down 34.20 points at 7968.20. The Sensex is down 120.98 points at 26623.71. 659 shares have advanced, 2059 shares declined and 74 shares are unchanged. Top gainers today is Cipla, Dr. Reddy's Labs, TCS, GAIL and Bharti Airtel. Top losers today is Axis Bank, Tata Steel, Hindalco, BHEL and ICICI Bank. Metal stocks continued to decline for the second straight session after the Supreme Court quashed allocation of 214 out of 218 coal blocks which were allotted to various firms since 1993. Pramod Gubbi of Ambit Capital sees short-term consolidation phase for Indian market but remains positive and believes that India still remains a buy on dips market. In mid noon sensex down to 188 point at 26556.68 and nifty move down to53.50 at 7948.90. 631 shares have advanced, 2056 shares declined and 69 shares are unchanged. In mid noon, P&G, Gujarat Pipavav, SKF India, Bajaj Holdings and Honeywell gained 2-2.7 percent while Cox & Kings, Jaypee Infra, IDBI Bank, Aban Offshore, and Allahabad Bank tanked 7-11 percent. Among smallcaps, KSL and AGC Networks, Savita Oil Tech climbed 4 to 9 percent whereas Usha Martin, Prakash Industries, Sarda Energy, Monnet Ispat and crashed Electrosteel 11-19 percent. We are providing free tral and intraday and delivery based profitable calls in equity and commodity market with high accuracy. In navratri festival we are providing 40% discount in commodity market. So hurry up all the investor invest a money in commodity market. Hurry UP. In navratri festival we are providing 25% discount in equity market. So hurry up all the investor invest a money in equity market. Hurry Now. ONGC fell 2.4 percent as Law Minister Ravi Shankar Prasad says cabinet deferred decision on gas pricing. "Decision on gas pricing will be taken before November 15," he adds. Oil India was down 1.3 percent.Currently nifty move on down on 7972.25 and sensex move down 26658.15. But some researcher said nifty and sensex cover up his point value after 1.00 pm. We are providing tips like as nifty tips, bank nifty tips, free nifty tips etc and provide free trial for 2 days. Today nifty sensex flat, nifty open at 8003.30 and sensex open at 26808.66. When opening the market nifty and sensex move down to some point but currently sensex cover up positive value and nifty move on some point either 10 point move down or 10 point move to up. The Sensex is up 53.48 points at 26798.17 and the Nifty is up 10.80 points at 8013.20. The Indian rupee opened flat at 60.92 per dollar against previous day's closing of 60.96. Top gainers today is Coal India, Cipla, SBI, M&M, BHEL. Top losers today is ONGC, Hindalco, Axis Bank, ICICI Bank. We are providing nifty tips, bank nifty tips, free nifty tips, nifty futures tips, bank nifty futures tips stock & share market tips. Today opening time nifty and sensex is positive but after few hours both market move down side continuously not a cover up any some positive value. Mid noon nifty currently running is 7972.10 down 45.45 point move as opening market. Same sensex currently running is 266.72 down 103.33. Researcher said today nifty and sensex not a cover up point. His believe nifty and sensex closed on down movement. About 788 shares have advanced, 2065 shares declined and 75 shares are unchanged. Now nifty gaining on 8000 but either 10 point move to up or 10 point move to down in down side from opening value. Currently gainers is HUL, Wipro, ITC, Coal India and Hindalco. Currently losers is L&T, TATA Power, BHEL, Hero Motocorp and Bajaj Auto. We are providing tips like stock and share market tips, nifty tips, bank nifty tips , nifty futures tips, bank nifty futures tips. Today nifty and sensex flat nifty open at 8015.55 gain 7.95 point and sensex open at 26817.94 gain 14.60. Yesterday nifty sensex both market closed on down The Sensex close at 26775.69 and nifty closed on 8017.55. 622 shares have advanced, 286 shares declined, and 33 shares are unchanged. Yesterday market effect all the investor 1.62 crore rupee loss of many traders. The Indian rupee opened with a marginal loss at 61.03 per dollar versus 60.94. Today top gainers is Wipro, Coal India, SBI, ICICI Bank and BHEL. Today top losers is Hindalco, Tata Motors, Tata Steel and Dr Reddy's Lab. We are provide intraday and delivery based calls in equity and commodity market with 96% high accuracy. Last 1 week nifty touch a high records and continuously high on 3 to 4 days but last 2 days nifty move on down today nifty closed near at 8000 point. We are seeing below before 17 September nifty down and after 17 September nifty jump to high record but on Tuesday nifty down 128.75 point value. We are Seeing on second chart today nifty market how many point down. In the morning the nifty opening point is down after opening 1 hours nifty not cover up any positive but its continue down lastly end of day nifty closed at 8017.55. Before 2 days Some researcher said nifty move on down and cross the 8000. today we are knowing researcher true all point value of nifty. Whose traders trade in nifty so carefully invest. We are provide nifty tips, bank nifty tips, nifty futures tips, bank nifty futures tips etc also provide free trial and profitable calls with 94% high accuracy. Today nifty sensex flat at closing time, Lastly nifty closed at 8017.55 down with 128.75 and sensex closed at 26775.69 down with 431.05 point. In morning nifty open on 8144.40 and sensex open on 27244.98, all day nifty and sensex move down. all day nifty and sensex continuously move on down not a cover up any positive movement. Researcher said after 1-2 week nifty move on 7900. So all investor invest a money carefully and continue see your target all time otherwise you going on loss so pls watches all point or take a good adviser for good profit. Top Gainers today is HCL Technologies, Wipro, Tech Mahindra, Hindustan Unilever. Top Losers today is DLF, Cipla, Ashok Leyland, Unitech etc. We are provide tips as Stock Tips, Nifty tips, Bank Nifty Tips, Nifty Futures Tips, Bank Nifty Futures Tips etc and provide free trial. Today Nifty market opening time flat, opening at 8144.40 and sensex opening at 27244.98 but This time nifty 8132.30 down with 14.00 and sensex 27167.31 down with 39.43. Yesterday we all saw nifty and sensex both are open down but in mid noon his cover up all point value with positive movement. In Singapore morning time market down 18 point in domestic market. 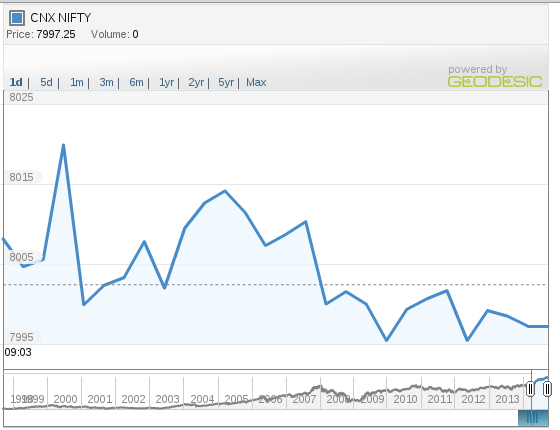 Below we are seeing CNX NIfty Chart Nify market open and its down 8132, this time cover up point value slowly. In this week Nifty touch to high but after a day market some time move on like 20 point down or 20 point move to up. Currently Gainers is TCS, Tech Mahindra, HCL Technologies, Hindustan Unilever Limited. Currently Losers is DLF, Hindalco, Mahindra & Mahindra Limited, NMDC LImited. We are provide free trial and full support, provide calls with positive target to the client.